CHICAGO (WLS) -- Meet Kobe, the Shedd Aquarium's newest rescue dog! The aquarium adopted the 3-year-old Dogo Argentino mix through Lucky Dog Rescue, a local group of volunteers who save animals from overcrowded shelters. 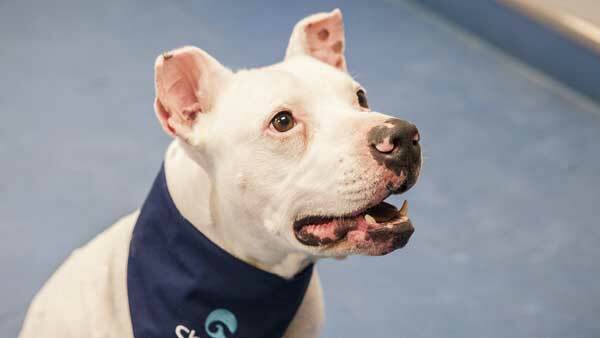 Kobe, a 3-year-old male Dogo Argentino mix, is the newest rescue dog at the Shedd Aquarium. Kobe was found as a stray in 2013. The aquarium said he was very thin and dirty when Kendall Animal Control stumbled upon him, and it looked like someone tried to crop his ears with a pair of scissors. Lucky Dog Rescue saved Kobe from animal control's euthanasia list and saw that the energetic dog learned new behaviors very quickly. He will join the Shedd's "One World" show after he builds a relationship with aquarium staff and gets comfortable in his new home. The "One World" show features a variety of animals and demonstrates the important role people can play in caring for animals, in the wild and at home. Kobe will live at the aquarium with two other rescue dogs: Dory, a female Shepherd mix, and Marlin, a male Labrador mix. Two other dogs who went through the Shedd's rescue program, Bruce and Coral, have been adopted into loving homes.